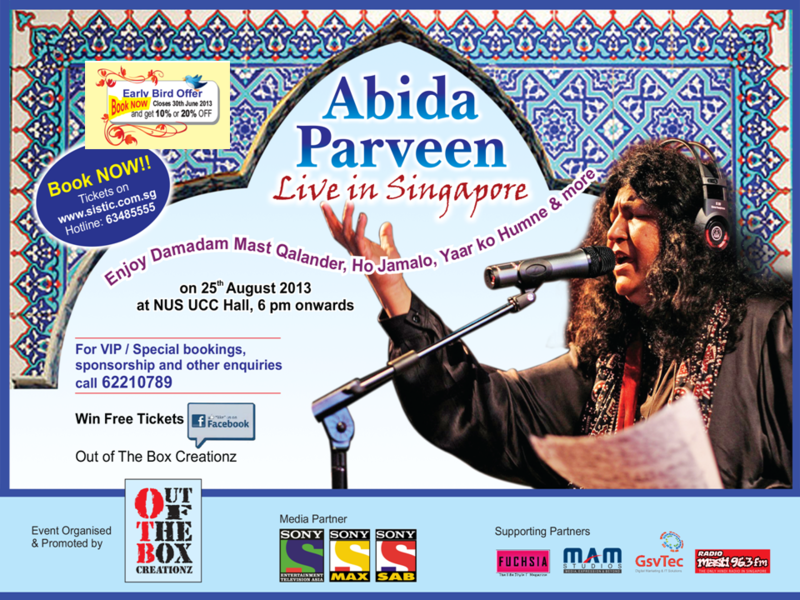 Abida Parveen Live in Singapore on Sunday 25th August 2013 is a musical concert featuring world renowned Queen of Sufi – Abida Parveen. Abida Parveen is considered the greatest spiritual singer alive today. Abida has the effect on listeners that could only be matched by none other than late Nusrat Fateh Ali Khan, who Abida has described as her ‘spiritual brother’ — and here she performs in Singapore in August 2013. Born in Pakistan of the Sindhi descent, this folk phenomenon Abida Parveen was perhaps surprisingly recently seen on India’s most famous singing reality show – Surkshetra (Music Battlefield), the hugely popular Indo-Pakistani TV singing talent Show. Pakistan’s famous TV Show, Coke Studio also featured her in an unplugged version that mesmerised viewers in an unprecedented way. Famous for her Kaafi style and Arfaana Kalaam, Abida Parveen begins each number as solemnly as the previous one as the evening progresses, sinking deeper and deeper into her kafi and Sufiana kalam of the mystic poets. She is a woman of very few words and asks to be judged only by her music. Abida Parveen holds an audience of thousands spellbound with her compositions and songs like Aap ki Abida, Chhaap Tilak, Tera Ishq Nachaya, Damadam Mast Kalander, Man Kunto Maula and many more. Abida Parveen Live in Singapore offers a rare opportunity to see one of the greats of modern devotional music and ghazals. The event will witness her Sufiana kalam of the mystic poets like Hazrat Amir Khusro, Nizamuddin Auliya, Baba Bulle Shah, Ghalib, Ghulam Farid and Faiz and more with her sole approach ‘Music should rise from the heart and go straight to the soul. Abida Parveen Live in Singapore is organised by Out of The Box Creationz Pte Ltd.
– Children 4 years old and above must purchase ticket for admission. – No Photography with Flash, Video recording and Audio recording is allowed for this event.